DK Eyewitness Top 10 US and British Virgin Islands will lead you straight to the best attractions these tropical islands have to offer. Whether you want to explore St Croix, St John, St Thomas, Tortola or Virgin Gorda and the Outer Islands, this travel guide is packed with essential information, whatever your budget. Your guide to the Top 10 best of everything in the Virgin Islands, youll find dozens of lists including the Top 10 fine restaurants, Top 10 beaches and spots of stunning scenery, Top 10 bustling bars and Top 10 places to stay, plus theres even a Top 10 list of things to avoid. 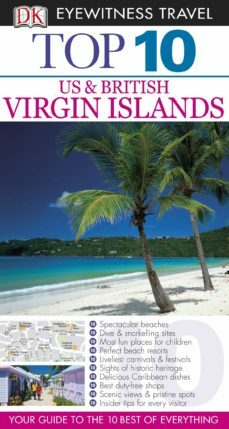 DK Eyewitness Top 10 US and British Virgin Islands is packed with beautiful illustrations and detailed cutaways of the greatest attractions on the islands, with comprehensive reviews and recommendations of the best they have to offer. Included with this DK Eyewitness Top 10 Travel Guide is a day guide to ensure you dont miss a thing. DK Eyewitness Top 10 US and British Virgin Islands - showing you what others only tell you.